Sometimes I feel like I'm a mad scientist with all of these propagated plants I have living in glass jars/vases all around our house. A lot of the time people pot their rooted plants in soil after they root, but not me. :) I really really love how plants look in water. I absolutely love seeing the roots and how i love how they grow together over time. After propagating and posting my rooted success on IG, over time I've realized that not everyone has had as much luck as I have with plant propagation! Which is why I want to share with you guys how exactly I propagate. It really isn't anything special in my opinion— I don't use rooting hormones or anything like that. But maybe my routine will be successful for you too! 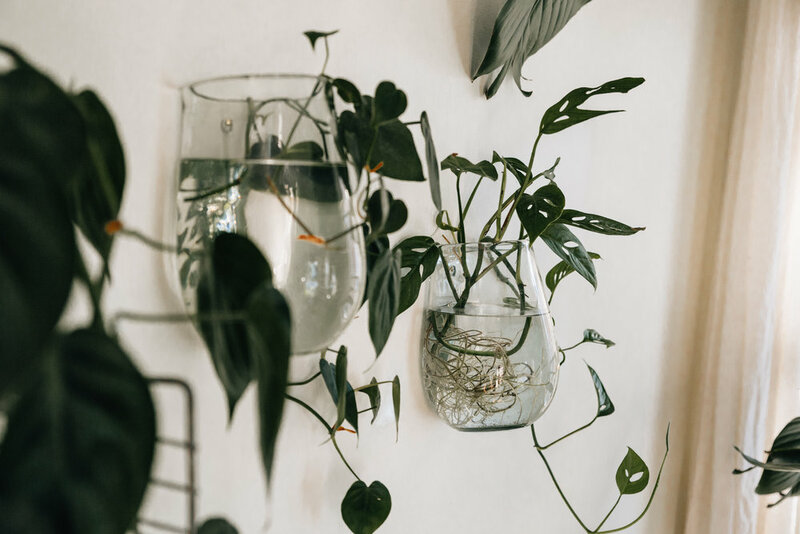 First, I'll give you some general tips on propagating and then I'll go off in a little more detail for the plants i've propagated (fiddle leaf fig, monstera delicioso, snake plant, monstera obliqua/heartleaf philodendron). With all plant care, in my experience/opinion (and many others I am sure) light source is the most important. For propagation, it's good to set your plant in bright, indirect light. I have had some of my propagation projects in very low/indirect light and they have rooted just fine. I have learned a lot about indirect light from House Plant Journal and a little by trial and error ;). Basically, from what I've learned—indirect light can be described as how much of the sky your plant can see. Not necessarily how much of the sun your plant can see. I will literally put my head where I plan to place the propagated plant and look out toward to window to make sure it's seeing a part of the sky. This method might be weird.. but it works for me. So it'll probably work for you too. I always, always, always use lukewarm water. A while ago I read that if you water you plants with cold water it can potentially shock the roots. I figured this rule would apply to propagation, too. So that's what i do. If I'm propagating a viney plant, like my monstera obliqua or my heartleaf philodendron, I always clip long stems. There's no particular reason why, I just think they are pretty. BUT! It is important to make sure there are nodes on your stem. Here's a close up of what nodes look like.. They are basically little brown lumps (I speak in very technical terms if you couldn't tell ;)). 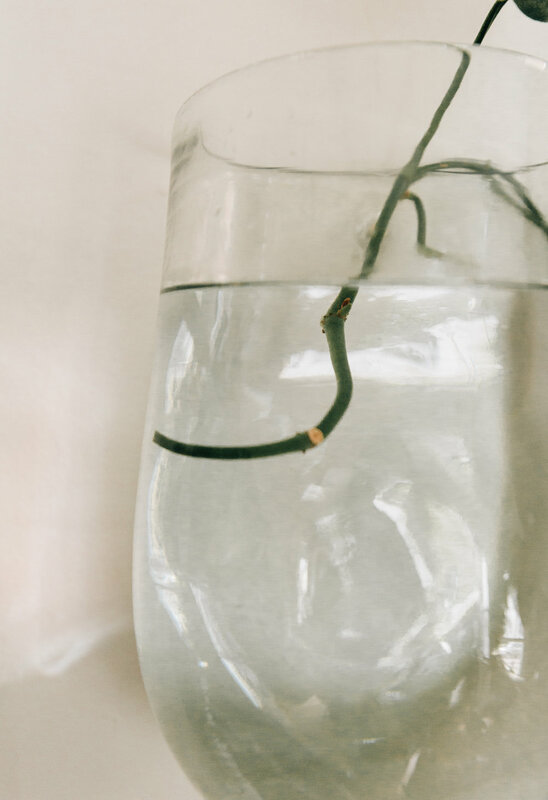 This is where the root begins to form in water, if you don't have nodes submerged under the water, your roots wont form. I also always pluck a couple of leaves off just so they don't sit in the water and turn yellow. these are my absolute favorite to propagate (and also super easy). using a knife, cut this guy at the lowest point that you can. Put him in a little cup of water or propagation tube and voilà. These for me have taken 2-4 weeks to see roots. however, I have read that it can take up to 3 months to see roots. this was another super random experiment for me that i really didn't expect to have success. I have read that it's really hard to propagate FLF's. I recently cut off the tops of my fig and just decided to stick them in cups of water to see if they will root! They rooted indeed, but this also promoted a lot of new growth for my fig! I was super excited to see roots and then even more excited to see new branches on the momma plant. FYI: I cut off 2 branches that each had 3 leaves on them. I'm not sure if this helped with the propagation, but it wouldn't hurt if you tried it this way too! & That's it! Propagation has been super easy for me and I hope my light source/water tip is helpful! Propagating is so much fun. Let me know what you think in the comments below! A creative Cleveland native with an endless love for design & craft. I'm Christine, your digital neighbor. 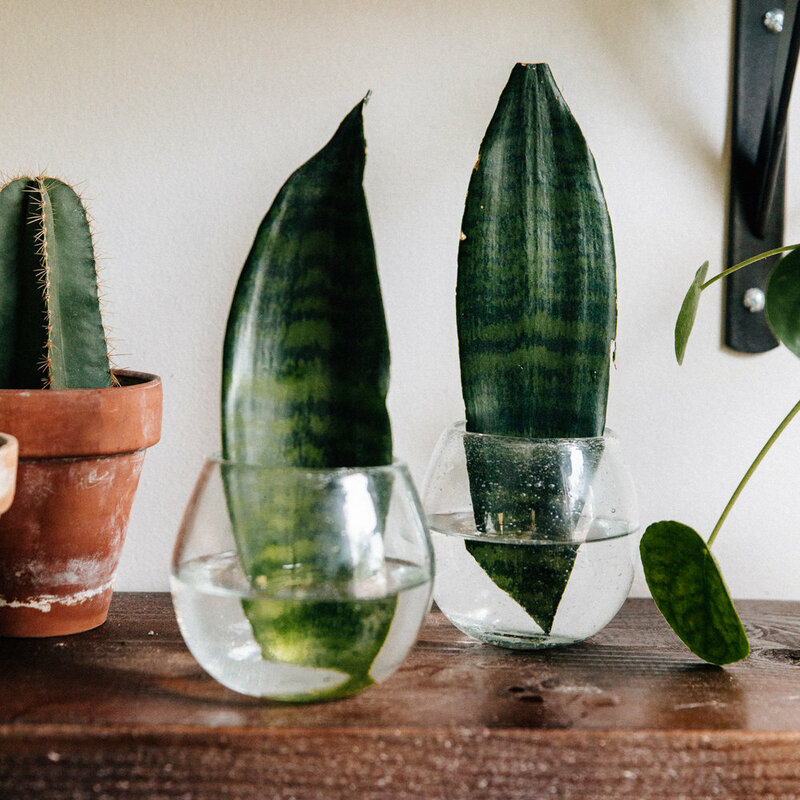 My husband (Shawn) and I are avid plant lovers that have a passion for decorating our home. 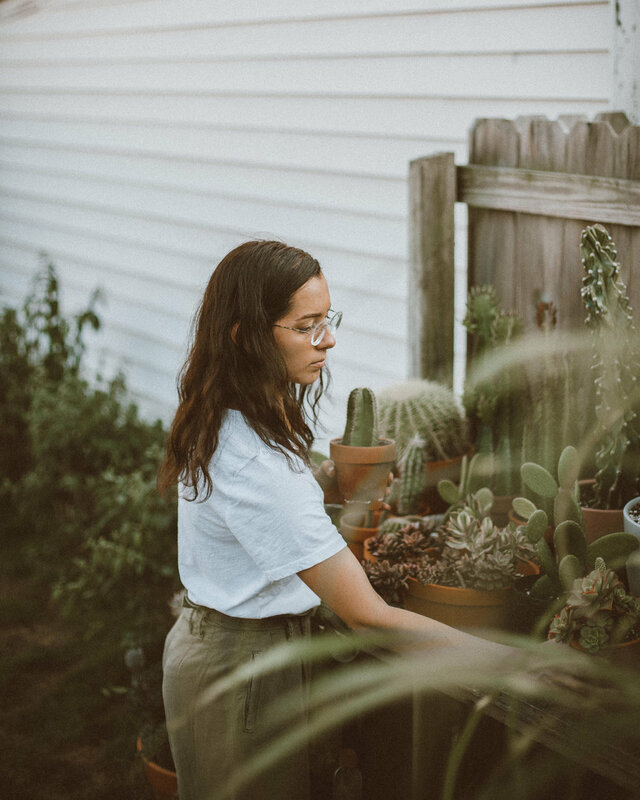 Follow along as we share our journey of new homeownership, projects, lifestyle and plant care.